1. 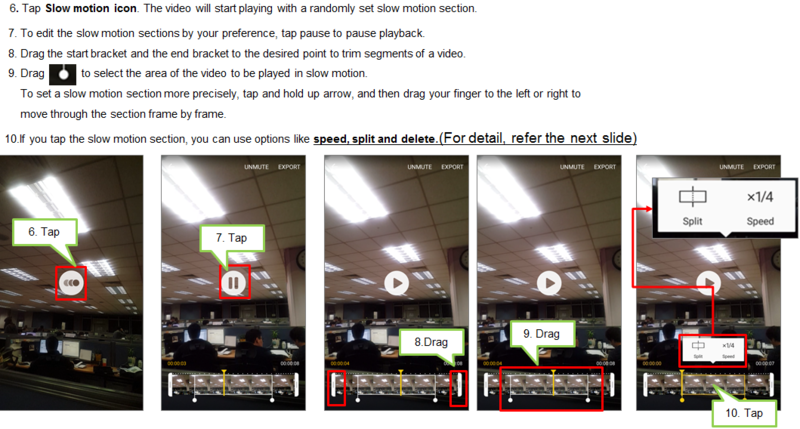 Using Slow motion mode, Record a video for viewing it in slow motion. You can specify sections of your videos to be played in slow motion. To take picture by Slow motion mode, On the preview screen of rear camera state, tap MODE. 3. Tap Recording button to start recording. 4. When you are finished recording, tap Stop button to stop. • Speed : Change the playback speed of the selected section. • Split : Divide the section into two parts. • Delete : Delete the section. 11. If editing is completed, tap EXPORT to save the video.